Oz Lotto is a national lottery game owned by Tatts Group and administered by ‘the Lotto’ in all-Australian States except Western Australia, where the lottery is administered by Lotterywest. It was introduced on 26 February 1994. It holds the record for the largest Australian lotto jackpot prize with four lucky winners sharing the jackpot prize of AU$111,972,151.04 in the draw on 6 November 2012. Draw takes place once a week every Tuesday, 20:00 AEST. Minimum jackpot is set at AUD $2 Million. To win the jackpot, you must match 7 main numbers. During the draw, 2 supplementary numbers are drawn in addition to the 7 main numbers. These supplementary numbers are significant for Prize Category 2, 4 and 7 only. Choose 7 main numbers from 1-45 or use our "Lucky Pick" random number generator to choose for you. Once you placed an order with us, you will receive your OneLotto official ticket(s), which can then be viewed within your “My Account“ page. Once each draw has taken place and the prize breakdown has been announced, OneLotto will publish and upload the results onto our website. We will also send out to all participating Players a full result email. There are total of 7 prize categories offered when playing Oz Lotto. To win the jackpot, you must match all 7 main numbers drawn. 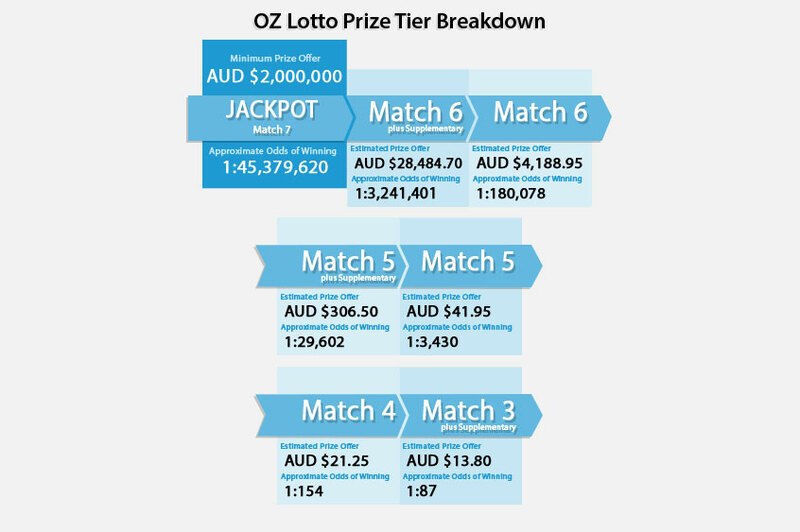 The table below shows the full breakdown of Oz Lotto winning prize tiers, including the approximate odds of winning and estimated prize amount.